Tooth-colored fillings are made of durable resin and composite materials color-matched to your unique teeth. A filling corrects a smaller tooth fracture covering less depth than an inlay, onlay, or crown. We can also remove old metal amalgam fillings—which may contain mercury—and replace them with tooth-colored fillings that will blend with your other teeth in a more aesthetically pleasing way. People are living longer lives these days, and the extra years give teeth a chance to break down and wear out. Fillings can last about ten years—sometimes longer—when cared for properly. An estimated 10% of American adults grind their teeth at night. Teeth grinding (bruxism) compromises the strength of the teeth, which can lead to severe and uneven tooth wear and other damage. An inlay fills a larger portion of a tooth’s biting surface than a filling contained within the cusp (rounded edges) of the tooth, while an onlay fills and covers the entire biting surface, including up and over the cusp. Inlays and onlays are considered an “older” restorative solution but have many advantages. They allow your tooth to withstand 50-75% more chewing pressure, are less expensive than a crown, and last longer than fillings. Inlays and onlays are also color-matched to your natural teeth for a more aesthetically pleasing final result. 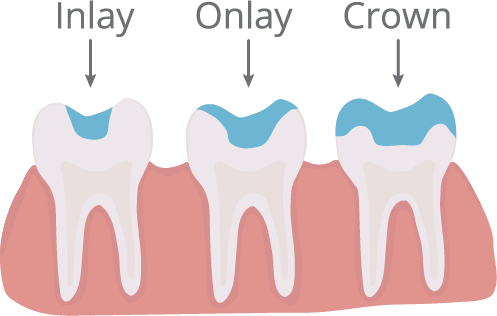 A short explanation of inlays and onlays: an intermediate solution between a filling and a crown. An inlay can repair the inner cusp of your molar, and an onlay can extend beyond these ridges. The materials used to create your inlay or onlay can be the same strong composite resin used to craft fillings, so they may be made of metal, porcelain, zirconia, or a combination of these. Crowns restore the entire surface of a tooth—everything visible above the gumline. They are constructed of durable, long-lasting materials such as zirconia, porcelain, resin, or a composite. Dr. Giron will advise you as to which material would be best for your individual situation, as each has its advantages and disadvantages. If a tooth-colored material is used for your crown, it will be color-matched to your teeth for a pleasing aesthetic match. Crowns are tooth-shaped caps that are designed to look, feel, and function just like the natural crown of your tooth. Our technology helps us craft a custom-fit crown that’s just right for you! Crowns can last for a decade or more when cared for properly. Crowns are also a component of other restorations, such as bridges and root canals, and are fabricated to blend well with your natural teeth. 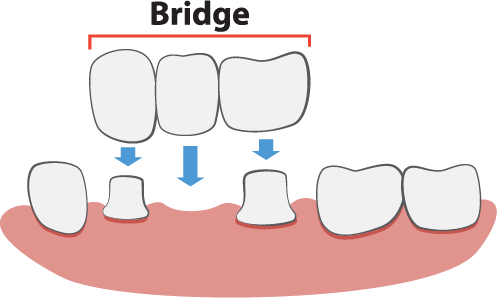 A bridge corrects a gap in our smile where a tooth or teeth are absent. (Bridge the gap—see what we did there?) Natural teeth on either side of the gap secure artificial teeth in place. Without a full set of teeth, other teeth will move into the gap and cause unnatural alignment of your bite, which can lead to headaches, TMJ and other problems. There are three different kinds of bridges—traditional, cantilever, and Maryland, with the traditional bridge used most often. Dental bridges can be removable or nonremovable. Bridges help to maintain your face shape, preventing further bone loss. They restore your ability to chew and speak easily and distribute forces in your bite more evenly by replacing your missing teeth. Strong is the new beautiful—get in touch today! Dentures and partials replace more missing teeth than a bridge. Traditional prosthetic dentures are the most affordable tooth replacement option on the market when a full arch (top teeth, bottom teeth or both) is missing. Materials and fabrication have drastically improved over the years and continue to evolve as technology advances. 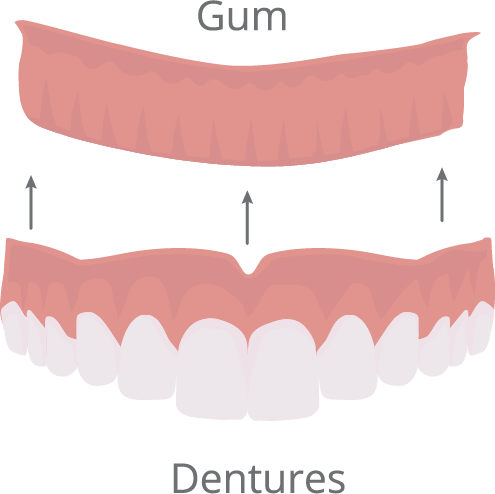 Partial dentures are designed to fill a gap and are supported by adjacent teeth rather than the gums. Today’s traditional dentures are lighter, more durable, more comfortable and more aesthetically pleasing than the dentures of years past; their construction allows them to fit better and more naturally than they once did. The dental field of specialty focused on dentures is called “prosthodontics”. A well-constructed set of traditional prosthetic dentures is almost indistinguishable from natural teeth, and since they are removable for cleaning, wearers can enjoy the food they love. 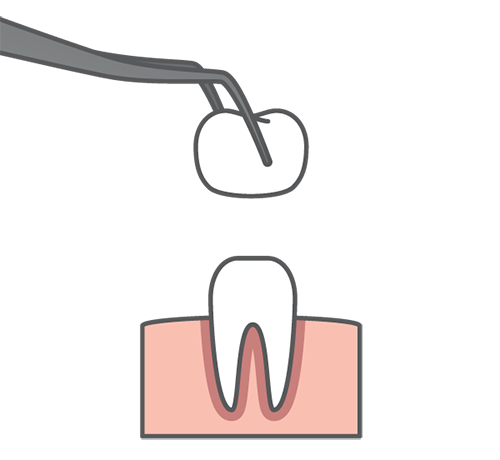 A root canal is removal of infection inside a tooth that permits the tooth to be saved. 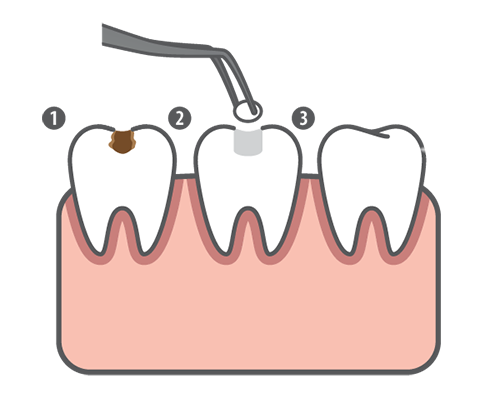 Once damaged tissues have been removed, the inner tooth (called the pulp) is sterilized, sealed, and topped off with a crown or filling to return the tooth to full form and function. The dental field of specialty focused on root canals is called “endodontics”. Millions of teeth are saved and treated each day with endodontic procedures. 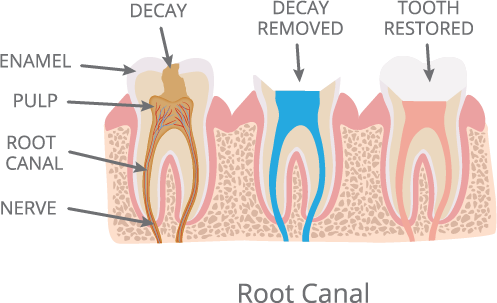 Deep decay or other damage can result in the need for a root canal. Root canals have gotten a bad rap over the years, but with technological advancements, the root canal procedures of today are usually no more complicated than getting a filling. With proper care, most teeth that have had root canal treatment can last a lifetime. Implants are the gold standard to replace teeth in the dental industry, ranking highest in satisfaction for both doctors and patients. Implant posts are made of titanium, a material capable of incorporating themselves into the jaw to mimic a natural tooth root. 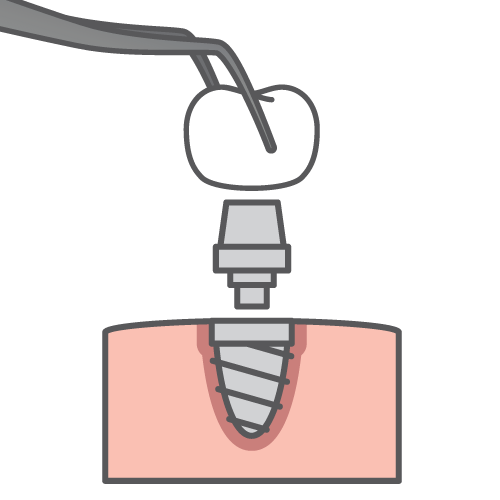 Once placement and restoration are complete, implants can be cared for like your other teeth. Dr. Giron will refer you to a trusted colleague for implant placement—and once the implant post has healed, he can complete the process with a beautiful implant restoration. Dental implants are a permanent solution to secure your smile. They look and feel like your own teeth, fusing with the bone to become a part of your mouth. The general success rate for most implants is about 98%. When cared for properly, most implants can last for a lifetime. There are many other advantages to dental implants. They improve appearance and comfort, filling existing gaps in your smile. Speech and eating become easier when missing teeth are replaced, and you’ll feel more confident about the way you look with a complete set of teeth.